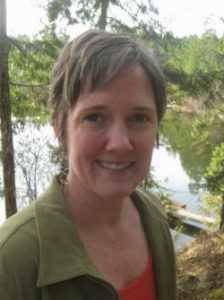 University of Washington Professor Deb Morrison will keynote Capturing Imaginations Building Skills, the second biennial joint conference of Ignite Afterschool and ScimathMN. Morrison will focus on closing equity gaps in STEM education. Improving equity within STEM teaching and learning is a central goal of recent policy conversations and reform. Both K-12 and informal STEM educators in Minnesota and nationally have long worked towards closing the STEM learning experience opportunity gaps that exist between students with varied lived experiences. In this presentation, Dr. Morrison will define the inequities found in our current terrain and explore research on practical solutions both informal and formal educators can use to disrupt cycles of inequity. A central focus of her work at the Institute of Science and Math Education is the way in which STEM instruction integrates students’ interests and supports expansions of identity development. Dr. Morrison will address generalized approaches used across science, technology, engineering, and mathematics as well as highlight some specific to science learning. You can learn more about Morrison’s work here. Registration for the November 29-30, 2017 conference is still open. Register at this link. 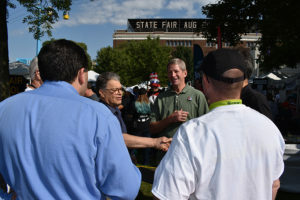 The 8th annual SciMathMN STEM Day at the State Fair, Minnesota’s annual celebration of all things STEM will again open the Great Minnesota Get Together, Thursday, August 24, 2017. 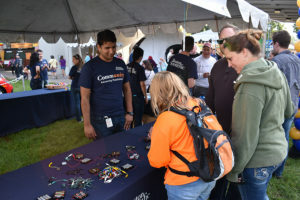 Past years have seen a broad variety of hands-on activities for fair goers in robotics, aeronautics and aerospace, programming, modern manufacturing, and a host of other STEM fields. 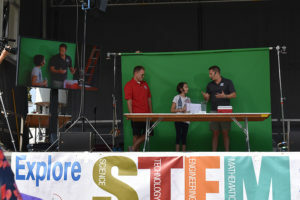 The event attracts a wide variety of fair goers with a growing number of families coming the first day of the fair specifically to attend STEM Day. Groups wishing to apply to be an exhibitor can apply here. In considering your organizations application please consider the selection criteria. 8. Organization’s ability to underwrite their activity. Funds for direct exhibitor support are limited. 4. 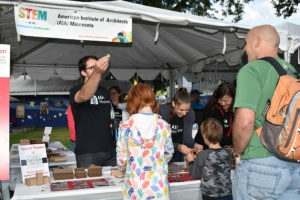 Organizations have a mechanism for community engagement in STEM or volunteer service to the community in STEM activities. 5. Date of submission of the application. The deadline for application submissions is May 13, 2017. The National Assessment of Educational Progress, NAEP, 2015 science assessment scores were released today. The test assessed public and private school students in three areas, physical science, life science, and Earth science, as well as broader principals of science. Participation in the test is voluntary by student, school, district and state. These 2015 scores are compared to either or both 2009 and 2011 assessment scores. 15 states saw increased performance at both 4th and 8th grades over 2009. Overall the gap between Minnesota and the nation as a whole is narrowing at both the 4th and 8th grades. Nationally 4th grade student’s achievement improved 4 points, from 150 to 154 on a 0-300 scale. This was deemed statistically significant. The test has three achievement levels, Basic, Proficient, and Advanced. 38% of 4th grade students were deemed as meeting or exceeding the proficient level. The gap in performance between White and Black or Hispanic students narrowed due to a greater increase in achievement by Black and Hispanic students. The male-female gap in scores was a not significant 1 point. At the 8th grade student’s achievement also improved 4 points, to 154. 34% of 8th graders scored at or above proficient. The White-Black and White-Hispanic achievement gaps slightly narrowed at this grade level as well, again due to stronger performance by Black and Hispanic students. This narrowing was not however statistically significant. The male-female gap in scores narrowed to 2 points over 2011 scores. At the 12th grade student’s achievement score remained flat at 150 points. 12th grade student science course taking increased from 53% to 57% over 2009. The number of students reporting taking a class in Biology, Chemistry, or Physics since 8th grade increased 7% to 41% over 2009. Minnesota public school results at the 4th grade were 4 points higher than the national average of public school students at 157. The 2015 average score was flat compared to the 2009 score. 43% of Minnesota students performed at or above the proficient level, flat from 2009. 80% scored at or above the NAEP basic level, not significantly different from 2009’s 81%. Black students average score was 41 points lower than their White peers; Hispanic students scores were 28 points lower. These differences were not significantly different from 2009. Students who qualified for free or reduced price lunch scored 29 points below those students whose families who are not eligible. This too was not significantly different from 2009. There was no statistical difference in scores between male and female 4th grade students. At the 8th grade level Minnesota students scored 9 points higher than the national average at 162. This was not statistically different over 2009 results. 45% performed at or above the proficient level and while this was above both 2009 and 2011 levels that was not found to be significantly different. 76% of students scored at or above the basic level, not statistically different than 2009 or 2011. Black students average score was 43 points lower than their White peers; Hispanic students scores were 32 points lower. These differences were not significantly different from 2009. Students who qualified for free or reduced price lunch scored 31 points below those students whose families who are not eligible. This performance gap was wider than in 2009 when the gap was 26 points. There was no statistical difference in scores between male and female 8th grade students. State level data was not available for 12th grade results. White Minnesota 4th grade students scored at the national average of their peers. Hispanic students, those reporting two or more races, and those eligible for free or reduced price lunch also scored at the national average of their peers. Black, Asian, and American Indian and Alaska Native students all scored below their national peers. White Minnesota 8th grade students scored 5 points above their national peers; Black, Hispanic, and Asian students all scored below their national peers. American Indian and Alaska Native students in Minnesota scored above their national peers. Students eligible for free or reduced price lunches scored above their national peers. An interactive map of NAEP results can be found at the link. The Teaching with Lake Superior conference offers an opportunity to connect, explore and network while learning new ways to bring STEM and the implemantation of the Next Generation Science Standards to life with your students. Click here to learn more and to register online. Contact Samantha Smingler at 218.740.2027or ssmingler@glaquarium.org with questions. The University of Minnesota’s Center for Early Education and Development is holding a free early mathematics conference for childcare providers and classroom teachers Thursday, November 17. The conference keynote is by UCLA Professor Meghan Franke, on developing children’s partial understanding. Her presentation will be followed by workshops exploring the role of counting collections, mth in children’s books, working with families to strengthen math skills, and the role that math plays in developing a child’s executive functioning. More can be found on CEED’s website.